Family owned with the freshest ingredients, Corner Pizza is "where good food and good people come together." “Where Good Food and Good People Come Together.” Family owned and operated by the Bourlogiannis family, Corner Pizza brings delicious passed down recipes and cooking styles down to the last pinch of salt to Bristol, Connecticut. The Bourlogianni’s share their pizza favorites with the community, all made homemade with heart, fresh to order. At Corner Pizza, the family and chefs are always working hard to bring the finest of ingredients together to make fresh delicious pizzas, dinners, appetizers, homemade desserts, and more right to your table. All of their Gourmet pizzas are masterpieces of flavor that are a must try. Try one of their many Gourmet pizzas today including their Georges Special Pizza, Clams Casino Pizza, and Grecian Delight Pizza. Corner Pizza is available for special occasions, and business meetings. They look forward to doing what they love for you, the cooking while you focus on the event! With a full catering menu full of dinner entrees, sandwich platters, and more, Corner Pizza has exactly what you need for your special occasion. Whether you are having a catered event, ordering take out, or dining in, in their relaxing dining room, you are certain to enjoy your homemade meal made with love and care. 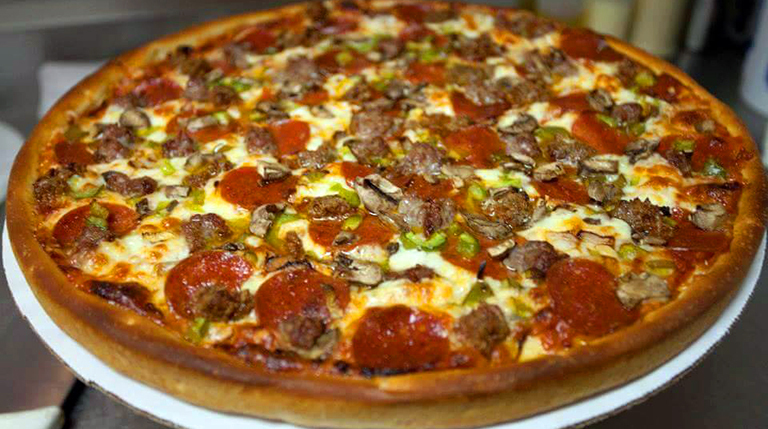 At Corner Pizza, you’ll leave with a smile on your face, and a satisfied stomach and taste buds!